The imaging method called cryo-electron microscopy (cryo-EM) allows researchers to visualize the shapes of biological molecules with an unprecedented level of detail. Now, a team led by researchers from the Salk Institute and the University of Florida is reporting how they used cryo-EM to show the structure of a version of a virus called an AAV2, advancing the technique's capabilities and the virus' potential as a delivery vehicle for gene therapies. "It's not an overstatement to say that this is one of the best cryo-EM structures that's ever been achieved in this field," says Salk Assistant Professor Dmitry Lyumkis, a structural biologist and co-senior author of the study. "We applied a number of different procedures that have previously only been described in theory. We demonstrated experimentally, for the first time, that they can be used to dramatically improve the quality of this kind of imaging." In the new study, the Salk investigators focused on a version of an AAV2 virus that has a particular change in one of its amino acids. This version is interesting because it's less infectious than some other AAVs, and is being studied for its important implications in the viral life cycle. The new research provided a structural explanation for why it's different from other viruses, by revealing key changes in the viral portal used to package DNA. "Ultimately, this kind of research has important implications for understanding the interactions between these different viruses and the types of cells they infect," says Sriram Aiyer, a research associate in Lyumkis' lab and one of the study's first authors. "This is important for developing a greater understanding of the human immune system and how it recognizes viruses." Professor Mavis Agbandje-McKenna, director of the Center for Structural Biology at the University of Florida and the paper's co-senior author, adds, "This technique will become especially important for developing a better understanding of how these viruses interact with the human immune system, which is one of the major remaining hurdles to the utilization of these viruses in gene therapy applications." 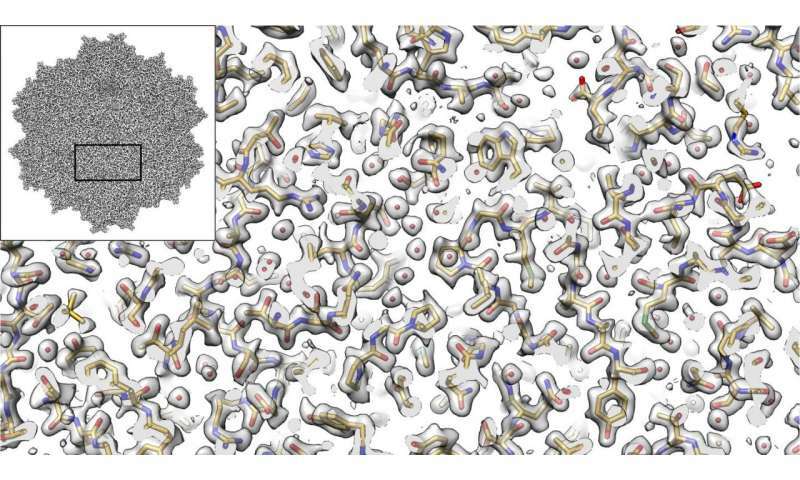 The size and shape of AAV2 made it ideal for the current cryo-EM analysis. "Because this virus has a high level of symmetry, it gave us more bang for the buck," Lyumkis says. "We were able to get 60-fold more information, which allows us to apply new computational techniques to create a better reconstruction of the molecule that will be extendible to many future high-resolution cryo-EM experiments." Lyumkis says that the data generation techniques illustrated in this study show that it's possible to extrapolate findings with lower-voltage microscopes than required previously. In the future, this will enable researchers to use new versions of cryo-EM instruments that cost less. "Cryo-EM microscopes are very expensive, and not many institutions have them right now. These findings will help open up this field to almost any academic institution doing structural biology research," he notes.